What types of equipment do you pick up? How can I check the status of a pick up or get copies of my reporting? How do you assure data security? What do you do with proprietary materials? What remarketing services does Blue Star Electronics, LLC offer? Complete the Asset Pickup Request Form online (click here) or contact us. Be sure to provide as much detail about the pickup as possible, paying particular attention to the number of assets or skids that will be transported. That will help us determine the size of truck that will be dispatched to the pickup location. Once we receive an asset pickup request, we will schedule the pickup within one business day. All types of electronic equipment. Both pick up status and reporting are provided to you directly as updates are available on line or Via USPS. Please call us at 408-327-0901 for more details. Using the standard Blue Star Electronics, LLC approach, the personal computers, servers, and workstations that pass testing immediately have their hard drives cleansed of corporate data and software through our US Department of Defense Approved Software. 1. Listed as an Approved Disk Sanitizing Tool by the U.S. Department of Defense. 2. Supports any size hard drive and any format. Such as (IDE, SCSI, SATA et.). 3. Contains optional command line parameters that enable the user to run the program from a DOS batch file. 4. Permanently erases operating systems, program files, and your data. 5. Erases ALL data from your physical drive. 6. Erases all partition tables and drive formats - FAT16, FAT32, NTFS, and Linux. 7. Verifies that your data has been erased. 8. Feature to display specified sectors on the drive. 9. Constructs a database of overwritten drives that can be imported into Microsoft Access?and Excel? • Permanently destroy your computerized data by simply running your hard drive(s) through our hard drive shredder. • Shred your hard drive(s) eliminating any chance of your critical/ personal data from getting into the wrong hands. • A program, in which a set value for each asset is returned to the client. We are a responsible recycler fully dedicated to a healthy environment for all of us. 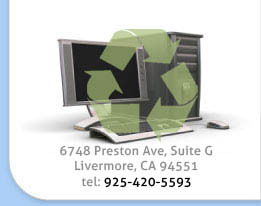 Blue Star Electronics, LLC has zero-landfill policy. We fulfill our customers’ requirements through strict regulatory compliance. We communicate our environmental policies to our employees and to our vendors. Our recycling partners are required to support sound environmental practices in their operations.